We all know that Patriot Memory is one of the companies that has been around for quite some time and is greatly known for creating innovative and new products that feature sleek, functional, and modern designs. A lot of their products are made of high-quality materials and everything you purchase from them is backed with the company’s industry-leading warranty, plus they also provide you with excellent customer support. Throughout the years, the company has been developing outstanding products that meet or even exceed their own high level of standards. They achieve this by including various types of tests such as real-world stress tests, overcharge tests, and drop tests. Patriot Memory ensures that all of their products undergo these tests to provide everyone with high-quality products. Aside from their excellence and modern designs, the company is also known for their continuous marketing and manufacturing of high-performance products such as flash memories, mobile accessories, memory modules, as well as gaming equipment. Lately, Patriot Memory has also introduced the Burst 240 GB SSD into their line of products and you can expect it to be just as efficient and highly notable as their other products. Now, let us talk and focus more on the Burst 240 GB SSD and see what it has in store for us. 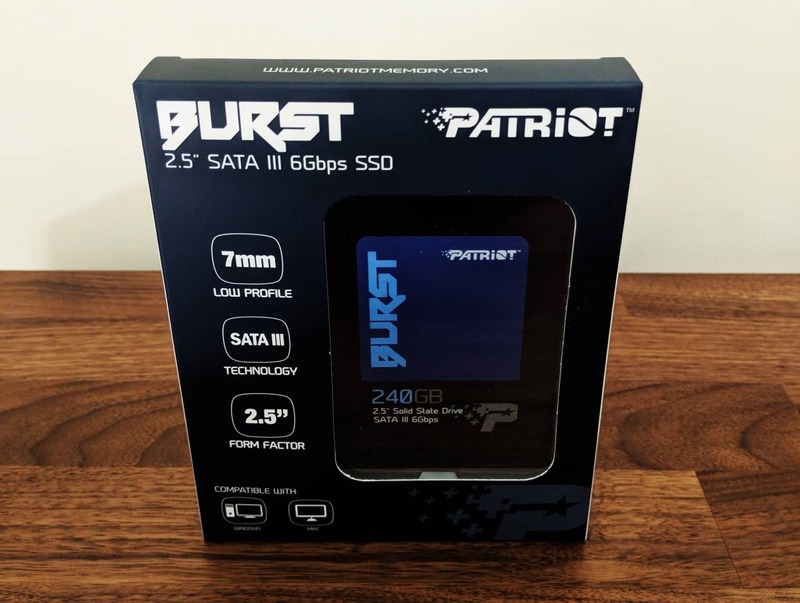 Patriot Burst 240GB SSD Review – Whats in the Box? The Patriot Burst SSD comes packed in some striking packaging that really showcases the Patriot branding. On the front of the package there is the company logo along with the product name as well as some of the key features of the SSD. There packaging contains a clear window so that you can see the Patriot Burst SSD in all of its glory. At the rear of the packaging there is additional information about the Burst SSD. Inside the box you will find the Patriot Burst SSD along with the instruction manual. The Patriot Memory Burst 240 GB SSD is one of the best ways for you to enhance and improve the performance of your computer. The Burst SSD provides you with exceptional transfer speed of up to 555 MB per second of read and 500 MB per second of write speed that removes all forms of bottlenecks. The SATA III 6 Gbps interface set backward is also compatible with the SATA III 3 Gbps; this SSD offers excellent and more improved performance over the classic HDD’s that are available. At only 7 millimeters high in a 2.5-inch form factor, the Burst 240 GB SSD can work excellently for any laptop or ultrabook enhancement. With the Burst 240 GB SSD, the company has continued to price very aggressively to offer you and everyone else one of the most outstanding price per performance ratios available in the market today. We actually liked the fact that the Burst 240 GB is backed by the award-winning build quality, as well as a three-year warranty for everyone’s convenience. With that, the Patriot Memory Burst 240 GB SSD will definitely be one of the most reliable and efficient choices in SSD’s today. Some of the notable features of the company’s Burst 240 GB SSD include the presence of the Phison S11 series controller, a DRAM cache – 32 MB SDR, the dynamic and static-wear leveling, bad block management, TRIM support, low power management, Smart Zip, and an MTBF of 2,000,000 hours. The Phison S11 Controller is also referred to as the PS-3111 and it is a single-core SSD controller. It helps provide the Patriot Memory Burst 240 GB with outstanding performance and is also specially designed for numerous types of embedded NAND applications and SATA modules. What’s great about the Phison S11 controller is that it can support up to two channels and sixteen CE in the NAND flash interface; moreover, it is also possible to reach up until ninety-five thousand IOPS random read, as well as eighty-five thousand random write. As for the NAND Flash Support of the Phison S11 controller, this supports 1z-nm MLC / TLC plus 3D flash, and also the MLC / TLC large block – 8k / 16k – NAND Flash memory. The TLC read / write speed can reach up to 550/500 MB per second for the sequential performance and 95 K/85 K random IOPS while the MLC read / write speed of up to 550/500 MB per second, for the sequential performance plus 95K/85 K random IOPS. Other features of the Phison S11 Controller include the Smart ECC, Guaranteed Flush, Smart Flush, Smart ZIP, implemented power-saving aspects, built-in dynamic and static-wear leveling, as well as end to end data-path protection. An SSD or solid state drive is nothing more than a product that is packed with a ton of flash memory chips. Its operating system needs to have the capacity to read, as well as manipulate all the data kept on the chips; for this to actually happen, the SSD needs to have a specific process to properly arrange all the stored data. In turn, the blocks are categorized into different blocks of data: to illustrate this further, just imagine that a solid state drive is a library; the library features a variety of shelves that are filled with a ton of different types of books. Yet what does happen when you want to completely remove one of the books stored in the library; let us say you plan to sell the book or perhaps, lend it to a friend? If this were a real shelf in a library, the most obvious thing to do would be to remove that specific book off the shelf; but since we are speaking of a solid state drive, things would be a bit different. When it comes to the SSD, if you want to delete a selection of data saved here, it will not matter if the data occupies a page from a specific area or block, the whole block would need to be deleted entirely. Meaning, all the other details and information located on other pages will be moved to an alternative buffer memory before returning these to the original block – it is basically like emptying the entire shelf from the library anytime you wish to remove a book or replace this with a new or different one. After, you will need to return all the rest of the booms back in their designated places. For a solid state drive to successfully write data on a previously used space, it should first wipe this entirely. Doing this occasionally whenever you need to delete or move data from your SSD would actually translate to poor and slow performance when it comes to writing speed. Luckily, the Patriot Burst 240 GB SSD features the TRIM command which allows your operating system to search for marked pages before needing these and wiping these clean. Cleaning these data pages in advance would save you a lot of time especially when you regularly need to write over data pages. Just imagine having your own recycling machine next to your work table that readily recycles pieces of paper that comes. And for this to work effectively, the TRIM feature needs to be supported by both the operating system being used and the solid state drive; when both of these adequately support the TRIM feature, individual pages can be readily cleaned and the SSD will be notified that the pages are blank and empty, allowing you to write on with other data. This type of communication and cleaning is vital to continuously keep the drive performing perfectly and at its best. Wear leveling, which can also be written as wear levelling, is a specific type of method that extends the life services of some types of erasable computer storage media like flash memories – this is something utilized as a solid state drive, USB flash drive, and even a phase change memory. Dynamic-wear leveling is known as the first type of wear leveling; it makes use of a map to connect logical block addresses or LBA’s from the operating system to the physical flash memory. Each time the operating system writes any form of replacement data, the map will simultaneously get updated so its original physical block will be marked as an invalid data, then the new block will be connected to that specific map entry. The other form of wear leveling is referred to as the static-wear leveling which also utilizes a map to connect the logical block address to the physical memory address. This type of wear leveling functions similarly to the dynamic-wear leveling; however, static blocks that do not get replaced are systematically moved; this allows the low usage cells to be utilized by other data available. This vorticular effect allows a solid state drive to continuously operate until most of the available blocks are nearing the end of life. At times, this is also referred to as the global wear leveling since the whole image is leveled. Let us now take a look at how to install the Patriot Burst 240 GB SSD for computer systems, specifically desktop and servers. First, turn off the computer and you should make sure that it is unplugged from the socket. Carefully remove your computer case’s cover to be able to install the Burst 240 GB SSD in an open hard drive bay. Now, you can connect the SSD cable to an open or available SATA host connector on your motherboard; directly plug in the SSD power to the power supply. After this, close the computer’s case or cover before powering on your device again; after, you can enter BIOS on your computer to ensure that the Burst 240 GB SSD is recognized by your computer’s BIOS. If you are planning to install the Burst 240 to a notebook, simply turn off the power of the device before removing the battery and power cable. Right after switching it off, unscrew then carefully remove the hard drive’s cover before removing the hard drive right from its bay; check for any spacer bracket or connector before actually pulling this out from the new SSD. Once you are done checking, you should align the SSD’s pins to the drive bay before sliding the product firmly and securely to the drive bay. This is when you should re-attach the panel before screwing this, then after, simply slip the device’s battery in before plugging in the power cable. Power on your notebook to be able to enter BIOS then make sure that the Burst 240 GB is properly recognized and detected in your notebook’s BIOS. Patriot Memory’s Burst 240 GB SSD provides excellent performance that we greatly appreciated; when it comes to the read / write speed, it is definitely much faster compared to the other traditional SSD’s in the market today. After checking out the product and doing a couple of tests, we have to say that we are greatly impressed with this SSD from Patriot Memory and we definitely recommend this for those who want an SSD that provides excellence and quality. What makes the Burst 240 GB better than the other SSD’s that are available is that it is packed with excellent features such as static and dynamic-wear levelling. Making use of just the dynamic-wear levelling is not really that sufficient to ensure the wear of all the data blocks in a single flash drive; static levelling should be part of the algorithm of wear levelling to allow the flash drive to readily achieve wear all throughout the drive while also providing the best product and endurance lifestyle. We also liked the fact that it features the TRIM support that works by blocking data that is no longer used and can just be wiped internally. Basically, if you’re searching for a great-performing SSD, the Patriot Memory Burst 240 GB SSD is definitely a great purchase especially for builders who are searching for a highly effective device that offers quality performance. So yes, the Burst 240 GB SSD is another notable product from Patriot Memory that we surely recommend. You can grab yourself a Patriot Burst 240GB SSD for only $109USD over at the official Patriot Memory store.